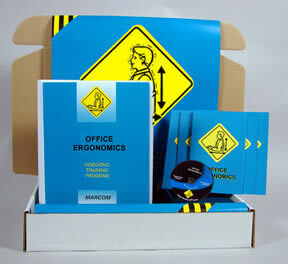 Description: MARCOM's "Office Ergonomics" Safety Meeting Kit™ addresses how to recognize ergonomic problems, the potential of adverse effects, and practical solutions employees can use to help deal with ergonomic problems in the office. Every job makes a different set of demands on the body. Today the issue of how this impacts employees, and what can be done to reduce or eliminate adverse effects is receiving a lot of attention. While there is much debate about many aspects of ergonomics, everyone agrees on one thing... that is by using proper ergonomic techniques, employees can be safer and more productive as well as feel better at the end of the day. Materials in the Kit include a Videotape Program, five motivational Posters, and 30 Employee Booklets. The Posters in the Kit remind employees to work safely and avoid ergonomic injuries. The Videotape and Employee Booklets include information on physiology of the body, parts of the body most affected, eye strain, pragmatic preventative measures, correct use of office equipment, exercises and stress release, and more. The Videotape Program in the Kit comes with a comprehensive Leader's Guide, reproducible Scheduling & Attendance Form, Employee Quiz, Training Certificate and Training Log.